Robbie Gustin, the friend at Guitar Center who would not take Kelley’s last and most valuable instrument, has his own story to tell about the edge of life and salvation. After drugs and depression brought him to his knees, he believes one of the reasons he was saved was to be at the right place at the right time for Kelley. Gustin had entered Kelley’s name in a contest sponsored by the national guitar store chain that crowned a “King of the Blues” each year, and he urged his friend to take one more shot at making his music work. But Kelley balked, not believing a musical contest was a true test of an artist’s ability. Gustin cut short that argument. With his slick head and a blond soul patch under his lip, Kelley carries the hip musician look well. But no attitude comes with it, just an easy smile and a duck of the head as he tells about what he does. “I guess slide guitar is my forte. If I’m known for anything, that’s probably it.” He said it with no trace of ego, even after having won that King of the Blues title. He refers to the contest as “little,” but last November he bested more than four thousand other guitarists, who competed at local Guitar Center stores across the country and in district and regional rounds. Kirby KelleyPhoto by Carl Dunn. Kelley’s Texas journey began when he was just out of high school. Through the years he has bounced back and forth between Texas and Missouri, with the last move back to Texas in the 1980s to run an ostrich farm. That bird did not fly, but Kelley settled in for the long haul as a Texan and besides Sherman, he and his family have called Grapevine, Bells and Muenster home. He entertained his family and friends for years, but severe stage fright kept him from performing until his thirties. While he was playing in a booth, testing an amp at a Dallas Guitar Show, an Ibanez guitar artist-relations rep saw him playing and sent him out to the National Association of Music Merchants show in California, where he met guitarist Mike “Junior” Clark. Clark dragged him out of his shell and forced him to face his stage fears. Now fifty years-old, Kelley has played with Clark and Texas blues man Bugs Henderson and now has his own Delta blues show. Delta blues may be his favorite, and what he does best. A heavier use of slide is one characteristic of Delta blues and Kelley has that mastered, sometimes using two slides, one on his little finger and one on his middle finger. He has an instructional video on slide guitar technique available. Live, Kelley wants his concerts to be events. He brings props such as old radios, so the audience gets the feel of being in a living room. Even though he has grown to love playing in front of a crowd, he still gets the jitters before shows. Odd construction and handyman jobs have supplemented Kelley’s musical income, but playing guitar is where his heart is. “There’s been really great times financially and really, really rough times too. I wish I could find that balance,” he said. During their twenty-seven-year marriage, Peg sometimes has worked two jobs to support their family that includes daughter Sarah. “In this business, with probably 99.99 percent of people I know, the marriage has never survived the monster of the music business. I’m absolutely blessed,” Kelley said. 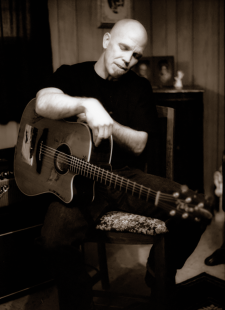 Visit Kirby Kelley on his MySpace page and check for local appearances. Peg said that their faith in God, love and a mutual appreciation for each other have kept them going through the bad times and acknowledged that those hard times probably outnumber the good. But early on, she realized that her husband was gifted. “I’ve always known that he was one of the best and had faith that someday somebody would see that. I prayed that others would see what I saw.” And so they have. When it was time for the guitar playoffs to begin in the King of the Blues contest, Kelley did not want to tell his wife about it. But Peg did find out through a friend and purloined her husband’s cell phone one night, using his contact list to call all his friends to get out and support him at the multiple contest rounds. When Kelley made it to the finals, she rounded up even more friends and family members to head to Los Angeles for moral support. Even now, as Kelley tells about it, he gets emotional. “It was a beautiful thing,” he said. With his fan base to cheer him on, Kelley said the contest was a “strange mix of emotions.” He was the oldest one in the final five to play in front of a capacity crowd at the House of Blues Sunset Strip in Hollywood. For his first song on the electric guitar, he performed a blues tune off a list contestants could choose from. Sitting in the front row were many of Kelley’s guitar heroes, including Steve Lukather (Toto) and Hubert Sumlin, who played with the legendary Howlin’ Wolf. “To see him [Sumlin], he was front and center, about three feet away from me, was just a surreal experience. And to think that he was there to watch me play was something I’ll never forget,” said Kelly. One YouTube video catches Sumlin and Lukather laughing and elbowing each other as they realize Kelley is using two slides. Sumlin nods in approval as Kelley’s hands fly up and down the frets through the song. Kelley looks at ease, as if he is having a good time, smiling now and again as he makes it through difficult parts. “If I was smiling, I was bluffing my way through it,” he said. “It was a little bit emotional; it was a lotta bit emotional, scary, intimidating, and chaotic.” To show guitar mastery, contestants had to perform a second song on an acoustic guitar. Kelley played his version of the Robert Johnson blues classic Cross Road Blues (made famous by Cream in 1969 as Crossroads). Among the prizes Kelley won were $25,000 cash, a Gibson ’59 Les Paul reissue guitar, a $2,500 Levi’s shopping spree, a Marshall Vintage Modern 50-watt half stack, a Boss GT-10 Guitar Multi Effects Pedal, a feature in Guitar World magazine, worldwide distribution of music in iTunes, and endorsement deals from Ernie Ball, Marshall Amplification, VOX Amplification, and Gibson. Not all the prizes have been realized yet, but Kelley is patient. “There’s a plan, I don’t know what the plan is, but it’s a God thing. Roll with it, right? I don’t ever take it too seriously. If I did, I’d a hung myself a long time ago,” he said, and laughed. “My motto is to just have fun.” No word from Guitar Center on when Kelley’s music will be available on iTunes. So, Kirby Kelley has been crowned King of the Blues, but do not call him “king.” “First, I want to say I’m full of gratitude for what they did,” Kelley said. “But there are so many players out there that are wonderful, wonderful players and I don’t consider myself above anybody in the music business. I don’t think that’s what the arts are about.” And this is what sets Kelley apart from some artists. He said that the music does not come from him, it comes through him. “You’re just a vehicle. We didn’t invent those notes. … I sincerely think God gave us all a wonderful gift,” he said. Even with the resurgence Kelley’s music career has seen in the past few months, he would like for his phone to be ringing more. He has picked up some endorsement contracts through the show, and he has quite a gig coming up June 26 when he opens for Eric Clapton’s Crossroads Guitar Festival 2010 in Chicago. Also on the bill, a few other famous acts such as B.B. King, Jeff Beck, Sheryl Crow, Buddy Guy, John Mayer and Clapton himself. When not on the road, Kelley is most at home with Peg and his five-year-old granddaughter, Ella. It would not be unusual to catch “Peeps” playing Barbie with Ella. “I’m all right with that,” he said, his face breaking into a grin. “I’m confident in my masculinity.” He also finds a peace in mowing the grass for some of his elderly neighbors, and in listening to them. “There’s so much wisdom in the elderly that gets overlooked,” he said. After the announcer called out his name as the winner of the King of the Blues competition, Kirby Kelley from Sherman, Texas, made his way up to the mike. He pulled a small rolled-up piece of paper out of his shirt pocket, one that he said a little girl gave to him about twenty years ago. “To POP, you are a good guitar player,” Kelley read to the audience, his voice choked with emotion. It was a note his daughter Sarah, then about seven years old, had slipped under his door in the dark hours of the morning when he was up late playing. The treasured note was a reminder that in a rough business that can bring even the best to the verge of selling their prize guitar, winning the praise of many was not nearly as important as what one little girl thought. That same night, Robbie Gustin received a call from Sarah, now twenty-seven, who through tears, thanked him for not letting her dad sell his last guitar. 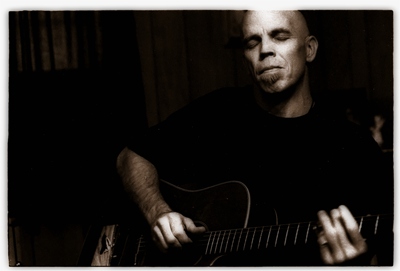 I’ve known Kirby since 2000 when I met him and enjoyed his music immediatly as I love Delta Blues. He is a good man, a good husband and a good father as well as a top guitar artist. If you know him consider yourself blessed. Was that Kirby playing the intro on the Crossroads 2010 DVD? That was better than most of the big names that appeared at the festival. Met Kirby at National Guitar Workshop about 12 years ago and have seen a him several times since. Amazing player & a genuine great guy. He’s always a pleasure to be around and loves to help everyone else. Got a huge heart. Kirby Kelley is a gem!